A 35-year-old Indian male presented with a 10 cm × 10 cm painless swelling in the left parotid region for 2 years. He had undergone wide local excision (WLE) of the swelling in the same area 2 years back, and the histopathological examination (HPE) suggested Kimura disease (KD). The swelling had recurred 14 months following WLE. Routine hemogram showed eosinophilic leukocytosis (total leukocyte count, TLC: 14,000/mm 3 , with 42.8% eosinophils). Computerized tomography scan of the face showed a left-sided soft tissue swelling of the cheek involving the parotid gland and adjoining subcutaneous fat plane. Fine-needle aspiration cytology showed eosinophilic infiltrate. 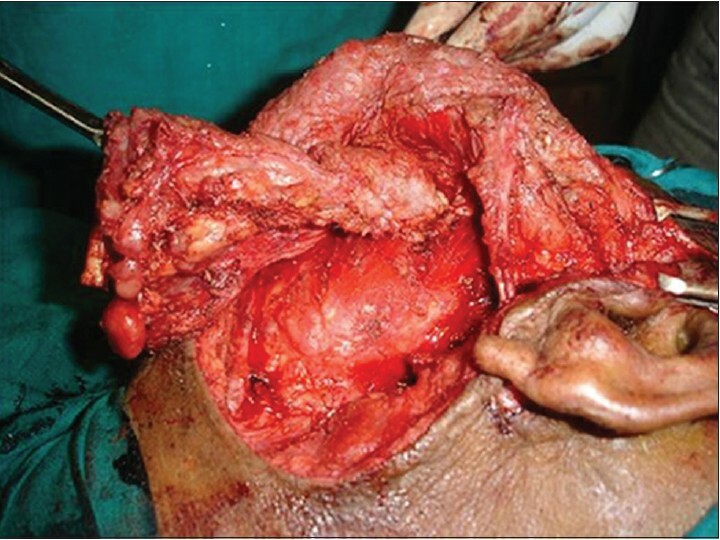 Nerve sparing superficial parotidectomy was done [Figure 1]. HPE revealed follicular hyperplasia and eosinophilic infiltration of lymph nodes suggestive of KD [Figure 2]. One month post-operatively TLC and the differential eosinophil count had normalized. Follow-up at 2 nd and 6 th months post-operatively revealed the patient to be asymptomatic and clinically free of any disease. Kimura disease was first reported in 1937 by Kimm and Szeto  from China, and later in 1948 by Kimura et. al. The etiology is unknown; allergy, infection, or an autoimmune process may have a role to play. The basic pathology is abnormal proliferation of lymphoid follicles, with eosinophil-rich infiltrate and peripheral eosinophilia. In the reported case, eosinophilia resolved after surgical excision of the tumor. KD is most commonly seen in young males of eastern countries in the third decade of life, which is consistent with the demographic profile of our patient , . The salivary glands, skin and lymph nodes in the head and neck region are commonly involved, especially the periauricular, parotid and submandibular regions. In our case, only the parotid gland was involved. There is an unexplained association with nephrotic syndrome in up to 20% cases  . Fortunately this was not seen in our patient. Surgical excision is the treatment of choice for KD. Recurrence is common, and re-do surgery, or systemic therapy may be required. Steroids are recommended in KD associated with nephrotic syndrome. Cyclosporine induces remission, but recurrence is observed once therapy is stopped. Radiation may be considered in recurrent cases with disfiguring lesions  . Although our patient had a recurrence, we did not give any adjuvant therapy, which we kept reserved in case a second recurrence occurred. Kimura disease should be considered as a differential diagnosis in Oriental patients presenting with parotid swelling and eosinophilia. Although recurrence and lymphadenopathy may suggest a malignant etiology, KD is essentially a benign disease and nerve sparing parotidectomy is adequate surgery for KD affecting the parotid gland. SP, SS and AD contributed to the literature search whereas SS, DM and AD helped in drafting the manuscript. All authors have read and approved the final version of the manucript. 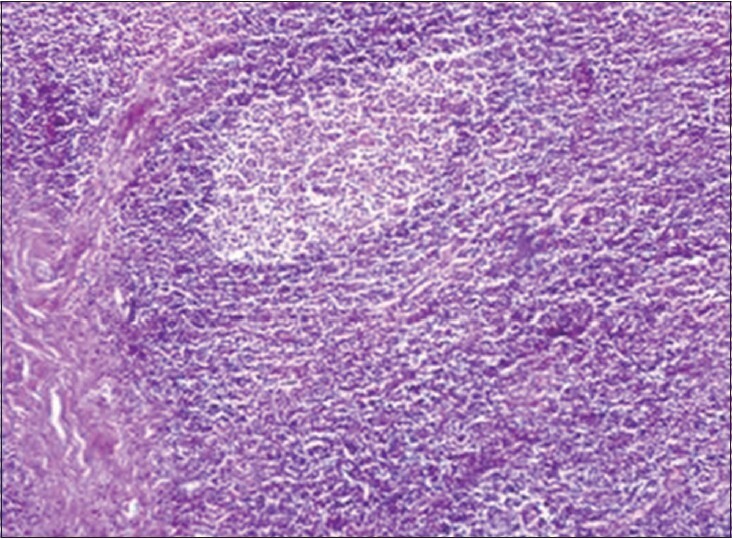 Kimm HT, Szeto C. Eosinophilic hyperplastic lymphogranuloma, comparison with Mikulicz's disease. Proc Chin Med Soc. 1937;1:329. Kimura T, Yoshimura S, Ishikawa E. On the unusual granulation combined with hyperplastic changes of lymphatic tissues. Trans Soc Pathol Jpn 1948;37:179-80. Chintamani, Sugandhi N, Khandelwal R, et. al. Kimura's disease masquerading as parotid malignancy. JRSM Short Rep 2010;1(5):41. Wang DY, Mao JH, Zhang Y, et al. Kimura disease: a case report and review of the Chinese literature. Nephron Clin Pract 2009;111(1):c55-61. Rajpoot DK, Pahl M, Clark J. Nephrotic syndrome associated with Kimura disease. Pediatr Nephrol 2000;14(6):486-8. Itami J, Arimizu N, Miyoshi T, Ogata H, Miura K. Radiation therapy in Kimura's disease. Acta Oncol 1989;28(4):511-4.